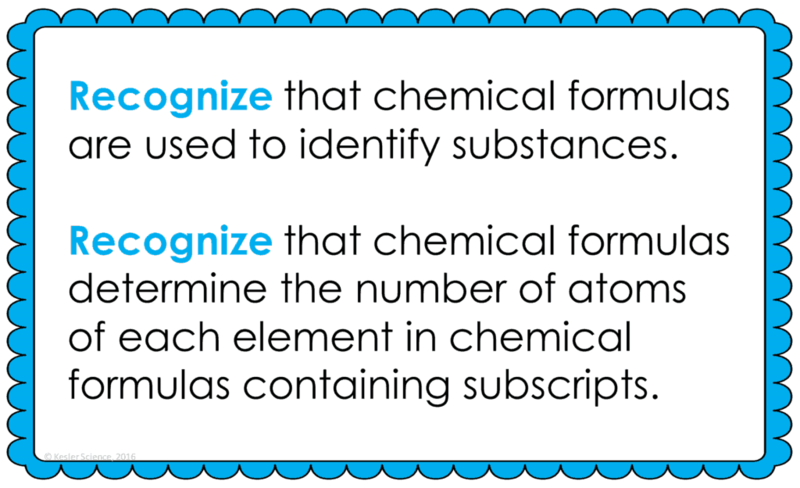 At the end of this counting atoms and elements lesson plan, students will be able to recognize that chemical formulas are used to identify substances and recognize that chemical formulas determine the number of atoms of each element in chemical formulas containing subscripts. Each lesson is designed using the 5E method of instruction to ensure maximum comprehension by the students. 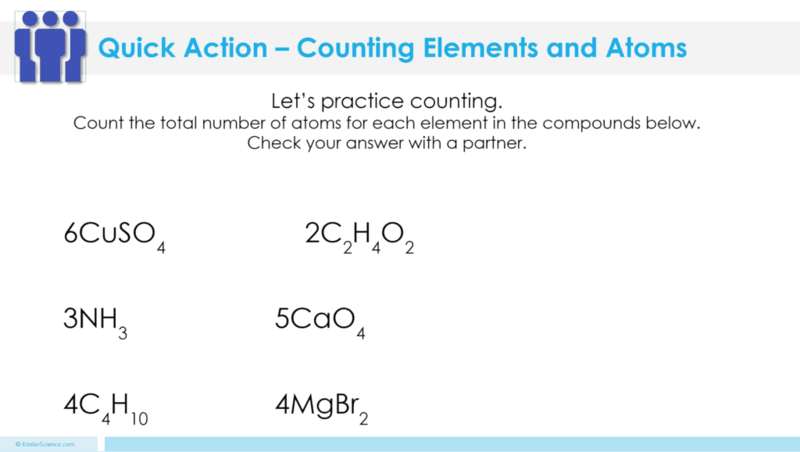 The following post will walk you through each of the steps and activities from the counting atoms and elements lesson plan. At the beginning of the lesson, the class will do a Think-Pair-Share to discuss the objective. 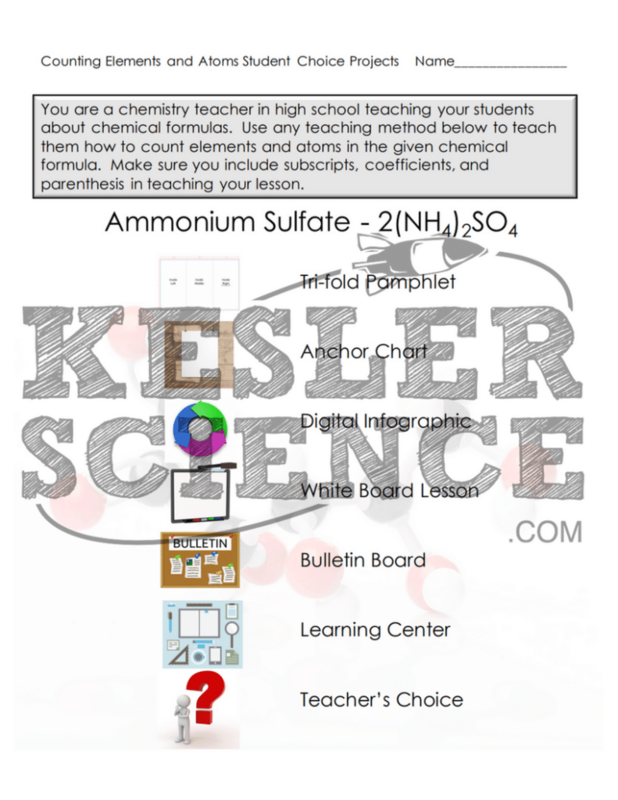 Review elements and their symbols using the periodic table. Put the formula C6H12O6 on the board. Give pairs of students each a formula card from the provided formula page included in the 5E lesson plan. Have them look at each of their formulas and determine the number of atoms of each element, the total number of atoms, and the total number of elements in each compound. Get with another pair of students to check their answers. 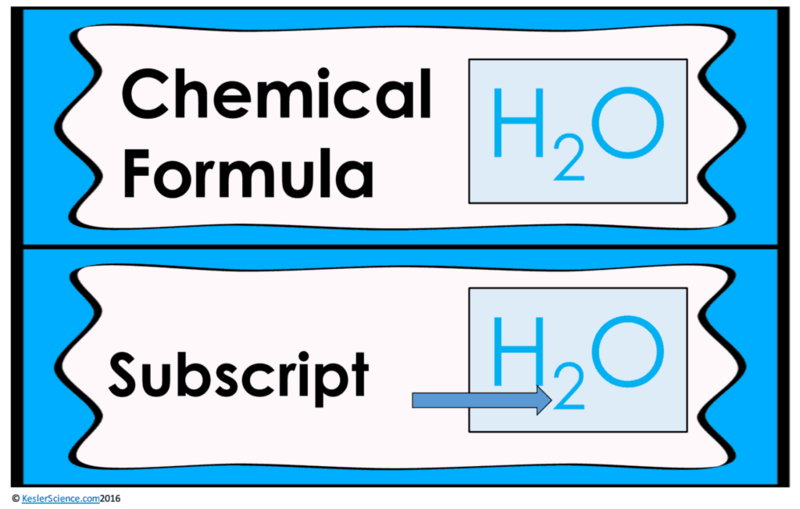 Add a coefficient 2(C6H12O6), and explain how that changes the number of molecules. Using the formula cards again, add the coefficient of 2 in front of the formula and have them recalculate the number of each element and the total number of atoms in each element. The teacher will help to clear any misconceptions about counting atoms and elements. A couple major misconceptions are students do not understand the multiplication process using a coefficient. Also, students confuse the number of atoms with the number of elements. This student-centered station lab is set up so students can begin to explore counting atoms and elements. 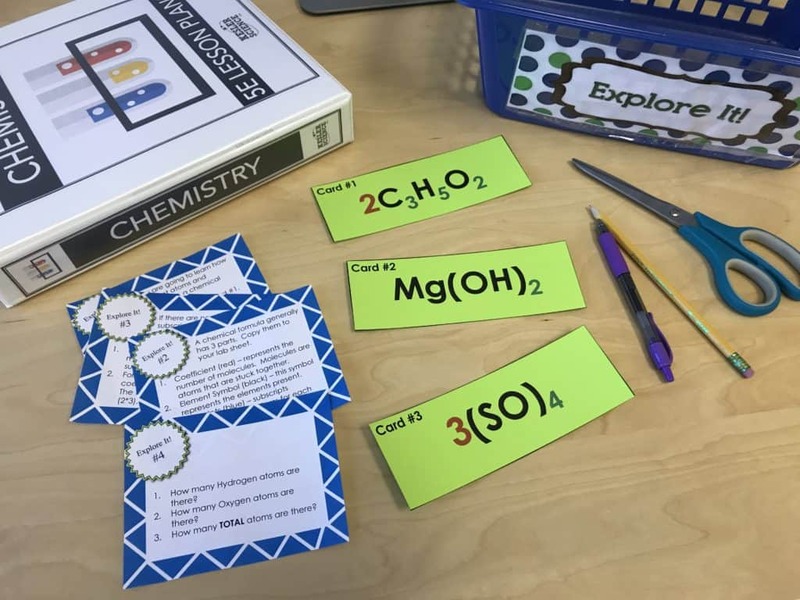 Four of the stations are considered input stations where students are learning new information about counting atoms and elements, and four of the stations are output stations where students will be demonstrating their mastery of the input stations. Each of the stations is differentiated to challenge students using a different learning style. You can read more about how I set up the station labs here. Students will be working in pairs to learn how to count the number of elements and atoms in three different compounds. 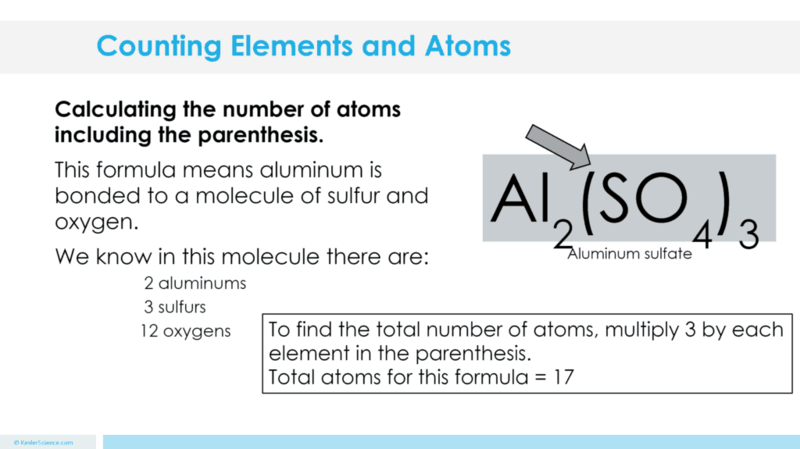 Students will have to follow the directions on the task cards and will learn how coefficients change the number of atoms but not the number of elements. 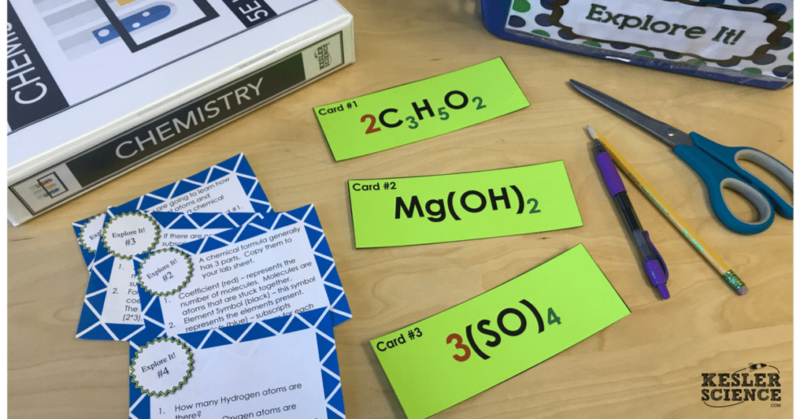 On certain cards, students are instructed to count the number of atoms of elements, and the total number of atoms in the compounds they are looking at. At this station, students will be watching a three-minute video explaining how to count atoms in chemical formulas. Students will then answer questions relating to the video and record their answers on their lab station sheet. For example, what does a coefficient represent in a chemical formula? How do you use the coefficient to calculate the number of atoms in each molecule? How many total atoms are in the compound below? The research station will allow students to discover the compounds in common household items. Students will look up compounds for items such as Bleach, Chalk, Tylenol, Battery Acid, and even Antiperspirant. Once students discover the formulas, they will need to calculate the total number of atoms and the total number of elements in each compound. This station will provide students with a one page reading about molecules. In the reading, students will discover how when elements bond together, they form molecules. The reading will take students from as far back as the formation of the solar system, to how today scientists are creating new molecules.There are 4 follow-up questions that the students will answer to show reading comprehension of the subject. The assess it station is where students will go to prove mastery over the concepts they learned in the lab. The questions are set up in a standardized format with multiple choice answers. Some questions include: How many elements are present in the compound below? How many total atoms are present in the compound below? How many atoms of Hydrogen are present in the compound below? Students who can answer open-ended questions about the lab truly understand the concepts that are being taught. At this station, the students will be answering three task cards: Explain how to count the number of elements in a compound. Explain how to count the number of atoms in a molecule that has parentheses () around it. Explain how the total number of atoms is different from the total number of elements in a compound. Your visual students will love this station. 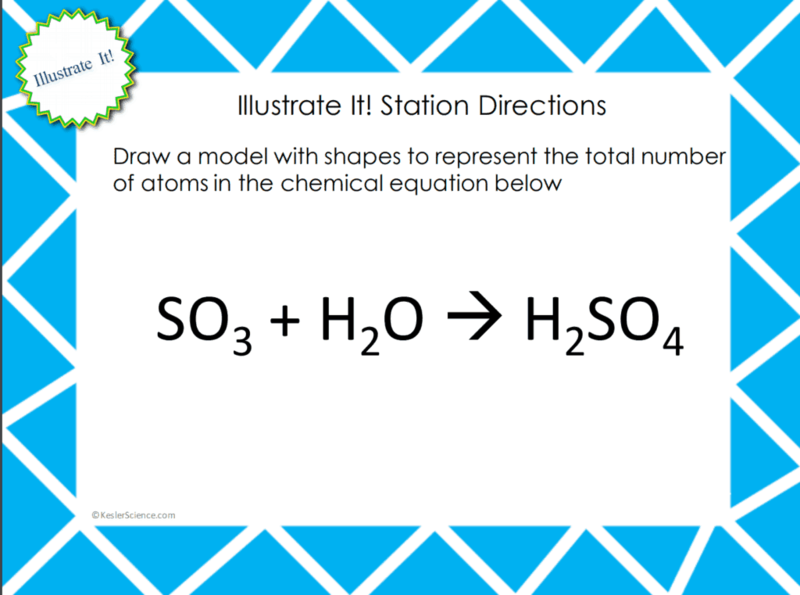 Students will draw a model of a chemical equation using different shapes to represent the different elements and the number of atoms for each element. The organize it station allows your students to place cards under the correct compound. Cards refer to the number of elements and the number of atoms that go with the correct compound. The explanation activities will become much more engaging for the class once they have completed the exploration station lab. During the explanation piece, the teacher will be clearing up any misconceptions with an interactive PowerPoint, anchor charts, and interactive notebook activities. The counting atoms and elements lesson includes a PowerPoint with activities scattered throughout to keep the students engaged. The students will also be interacting with their journals using INB templates for counting atoms and elements. Each INB activity is designed to help students compartmentalize information for a greater understanding of the concept. 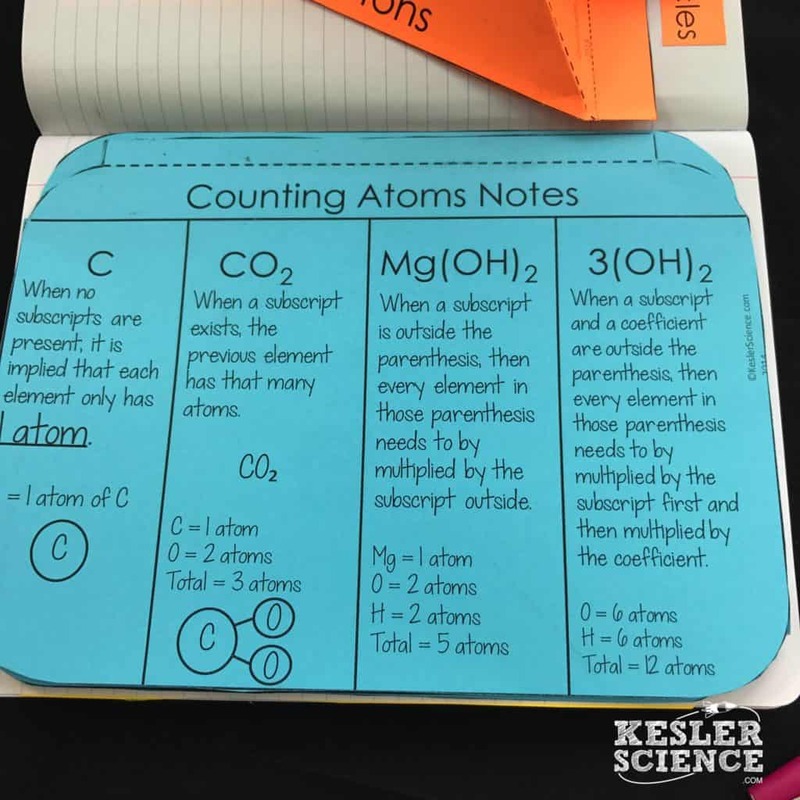 The counting atoms and elements INB template allows students to focus their notes on learning how to count the number of atoms and elements in compounds. The INB templates also come with a number of practice compounds that allow students to master the concept. The final piece of the 5E model is to evaluate student comprehension. Included in every 5E lesson is a homework assignment, assessment, and modified assessment. Research has shown that homework needs to be meaningful and applicable to real-world activities in order to be effective. When possible, I like to give open-ended assessments to truly gauge the student’s comprehension. The full lesson is available for download from my TpT store. Save yourself a ton of time and grab it now.